If you’ve ever browsed an article on weight loss, healthy eating, healthy living or anything like that, then you’ve probably read about green smoothies. The green smoothie hype is alive and well and with good reasons! Believe it or not, these drinks can help you get started on your road to better health and better eating habits, even if they’re not exactly the miraculous drink people insist they are. So how to find a best blender for green smoothies? Keep reading to find out! Let’s keep it simple: The biggest reason why you should start drinking green smoothies is because they’re good for you. We all need vegetables and fruits in our diets in order to r﻿emain ﻿﻿he﻿althy. Unfortunately, not everyone has the time or the opportunity to include them in their diet and, let’s face it, plenty of people out there just aren’t used to eating them. Not only are green smoothies easy to make but they’re also very fast. All you need to do is chop the ingredients, blend them together and serve! Better yet, you can have pre-chopped ingredients or frozen fruit ready to go so you don’t have to chop anything. Not easy enough? Just place all the ingredients in the blender cup and leave it overnight in the fridge so you can wake up and blend the next day. No hassles! - Green smoothies can help you regulate your digestion by increasing the amount of fiber you consume. If that’s not enough, you can always throw in a couple of prunes which will not only help you but will give your smoothie a whole new twist! - Green smoothies can help your skin look cleaner, as reducing refined sugars and increasing your water intake can reduce and even stop breakouts! - Green smoothies can help you lose weight by doubling as meal replacements. Believe it or not, green smoothies can have much more than just fruits and veggies. Throw in a couple of scoops of protein powder, a cup of oatmeal and you’re left with a powerful drink that’ll keep you going as well as a full meal with less than half the calories! - Green smoothies can help you build muscle: To build muscle you need protein, a lot of it, as well as to increase your caloric intake. Green smoothies can help you with this if you drink them between meals! There are hundredths of green smoothie recipes out there and each one promises to deliver different results. Some are protein packed, others work as meal replacements. Some have a ‘cleansing’ effect while others promise to give you energy that can last all day long. All these effects are achievable thanks to the ingredients in green smoothies which means that you can replicate these effects in other meals! Think of green smoothies as the building blocks of balanced nutrition. 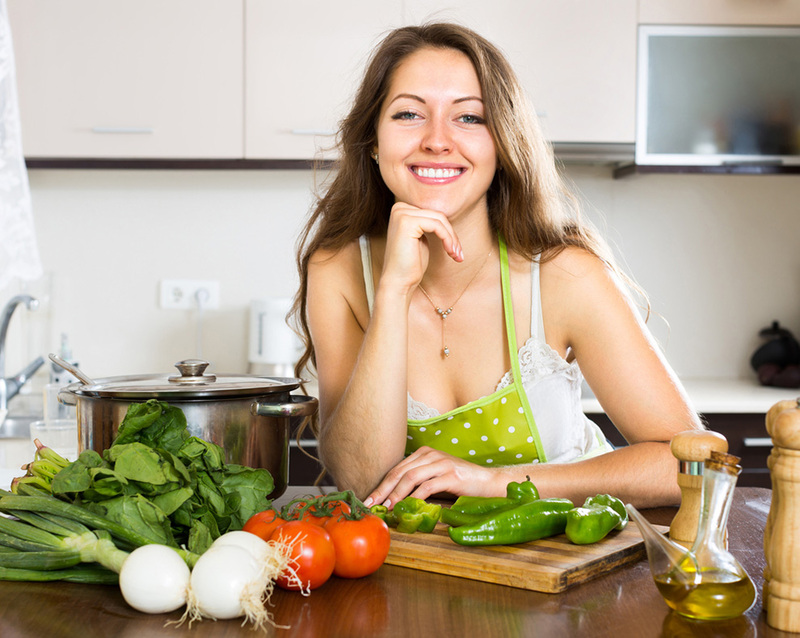 Once you start tweaking and changing the ingredients in the smoothie to achieve certain effects then you’ll feel more comfortable experimenting with all your other meals! You probably noticed the absence of the word “juicing” in the previous section and there’s a very good reason for that. 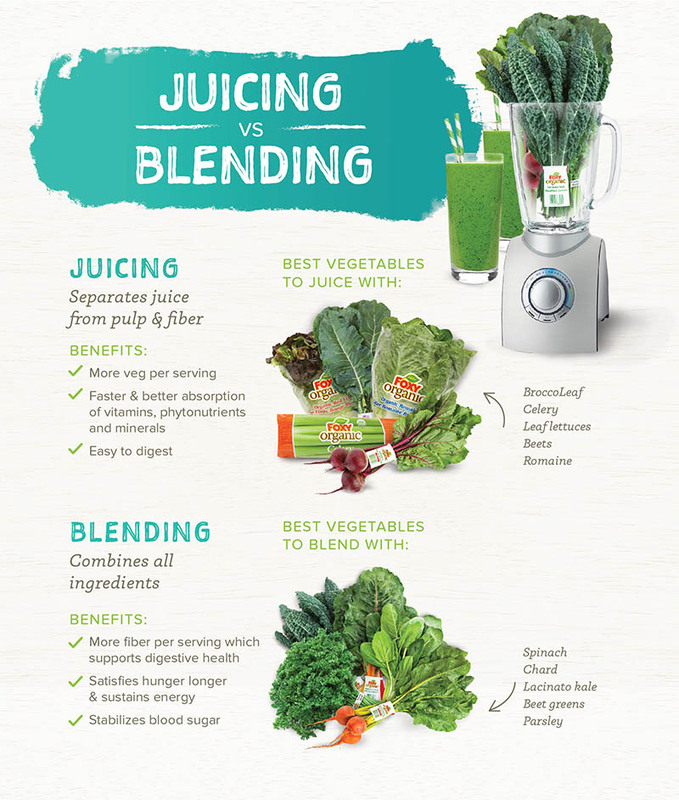 Blending and juicing are two completely different things and, spoiler alert, blending is much, much better for you. When you juice fruits and vegetables you separate the pulp from the liquids, leaving you with a high in sugar, albeit delicious, juice. While this juice is undoubtedly better than the pre-packaged juices you can find in the supermarket, they’re also more sugar than anything else. Most of the vitamins, fiber and other goodies that make vegetables and fruit so… well, good, are left behind in the pulp. Imagine that. Buying perfectly good produce just to toss away most of it! That’s pretty much what you do when you juice. Blending, on the other hand, consists on mixing all the ingredients together. Pulp and all. As long as you don’t strain what you’re blending, you’ll be using 100% of the produce and, thus, acquiring 100% of their benefit. Of course, you’re going to have to get used to the thick texture but there’s an easy solution for this… Use more water! If you still need convincing look at it this way. Juicers were created to juice, which can help you make green smoothies. Blenders were created to blend, which can help you make green smoothies, all kinds of drinks and even aid you in food recipes by helping you create creams, soups and more! In short? Blenders are far superior than juicers and you should choose blending over juicing every time. When it comes to green smoothies it’s hard to beat the popularity of the Magic Bullet types, if only because they’re the ones that started it all. You’ll be happy to know that they haven’t rested on their laurels either. Since the creation of the Magic Bullet many more advanced models have surfaced and the NutriBullet is one of them. The NutriBullet is a powerful, fast and convenient smoothie machine that can double as a food processor thanks to its powerful motor and great design. Despite the fact that this blender can’t handle ice cubes at all (seriously, don’t try it, you might damage your machine) it can help you create almond milk, grind your own coffee beans and more! If you choose to buy this machine, remember not to overfill it, as this can cause some serious leaking issues. Also, when it comes to cleaning, remember to take out the inner plastic rings, as food tends to get under those! This versatile single-serving blender is so powerful. It can crush ice, seeds, and frozen ingredients at the touch of a button. It can serve as a mine food processor as well as everything else! Perhaps the best thing about this machine is the assortment of things that come with it. It has stainless steel 6-piece blades, lids, 32oz containers, 24 oz container, storage lid, travel lid, cleaning brush and recipe book. Unfortunately, this particular blender isn’t as strong as it could be but as long as you’re not looking forward to blend really solid things (or ice cubes) then you should be fine. If you care about function as much as you care about looks then the Epica Blender is definitely the choice for you, as this smoothie blender looks as good as it works! You can tell right away that a lot of emphasis was put in the portability of the blending cup as you can take it with you no matter where you go. This gives the Epica a whole new level of versatility because you can blend, screw on the right cover and take your smoothie with you. No need of using another cup, which will save you time cleaning! The cup even fits car mug holders so you really can take it with you on your way to work. Unfortunately, this level of portability does involve some sacrifices because the blender cup is narrow which means you won’t be able to comfortably insert vegetables or fruits without chopping them first and you can forget about sliding your hand in for easy cleaning. There’s also the fact that, because this blender was designed with smoothies in mind, it isn’t strong enough to work with anything else. However, we feel those are small downsides to an otherwise great machine so if you’re planning on drinking green smoothies on-the-go then you should definitely consider the Epica Personal Blender. This powerful smoothie blender is and useful tool both for smoothies and everything else! 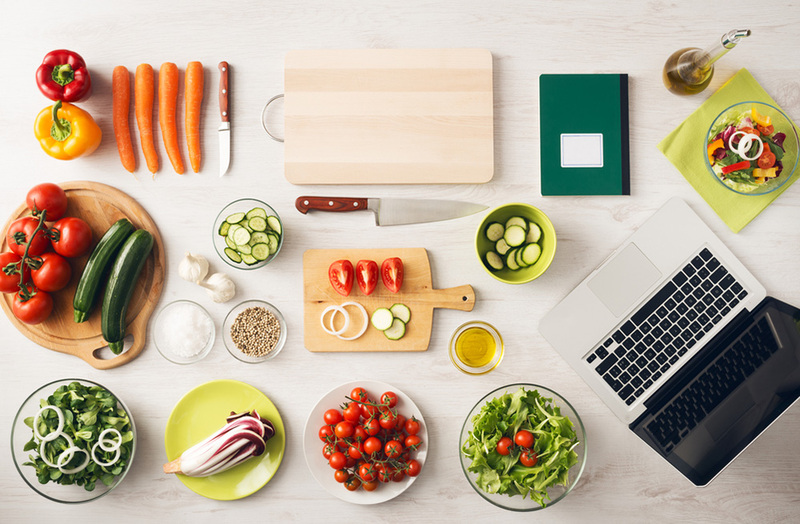 Just like the NutriBullet and the VonShef, it can actually be used as a regular blender (ableit a smaller one) giving you the power to cook all kinds of things. Better yet, just like the Epica, it was designed with portability in mind so you can take the blender cup with you anywhere you go and it comes in an eye catching yellow color that makes it stand out from other blenders. Unfortunately, just like the Epica, the opening is rather narrow so you’ll find yourself having to chop the ingredients before sliding them in. However, it is a more powerful machine so you’ll be able to blend nuts, oatmeal, seeds and more. Just like every other smoothie blender in this list, it fails to blend ice safely but it does handle crushed ice well. If you’re looking to have ice cold drinks, however, we recommend using frozen fruit instead of ice. It’s better for the machine. Last but not least, we have the most peculiar smoothie blender in the list, not because it works differently than the rest, since it does pretty much the same, but rather because of the way it was built. Most personal blenders have a base, which makes the blades spin, just like every other blender. The Ninja Master works more like a milkshake blender, with the blades on top of the machine. The change of design means that this particular smoothie blender has a much bigger capacity than the rest. It can hold up to 6 cups of water which means that it can make more than one smoothie at the time. Perfect for the entire family or for a smoothie party with friends. Best of all, the difference in size and design means that this baby can actually blend ice. Not crushed ice, not frozen fruits. Ice, actual ice cubes which makes it by far the most powerful of the bunch. Of course, the design does mean it can’t be used to grind coffee beans or seeds, for example, but it does reduce the risk of spilling to a minimum so it has that going for it. What's The Best Blender For Green Smoothies? As you can see, green smoothies are a wonderful way of improving your eating habits and they’re super easy to make since there are plenty of smoothie blenders out there to do all the job for you. It’s only a matter of choosing the one that meets your needs the best! This blender is very powerful, fast and convenient. 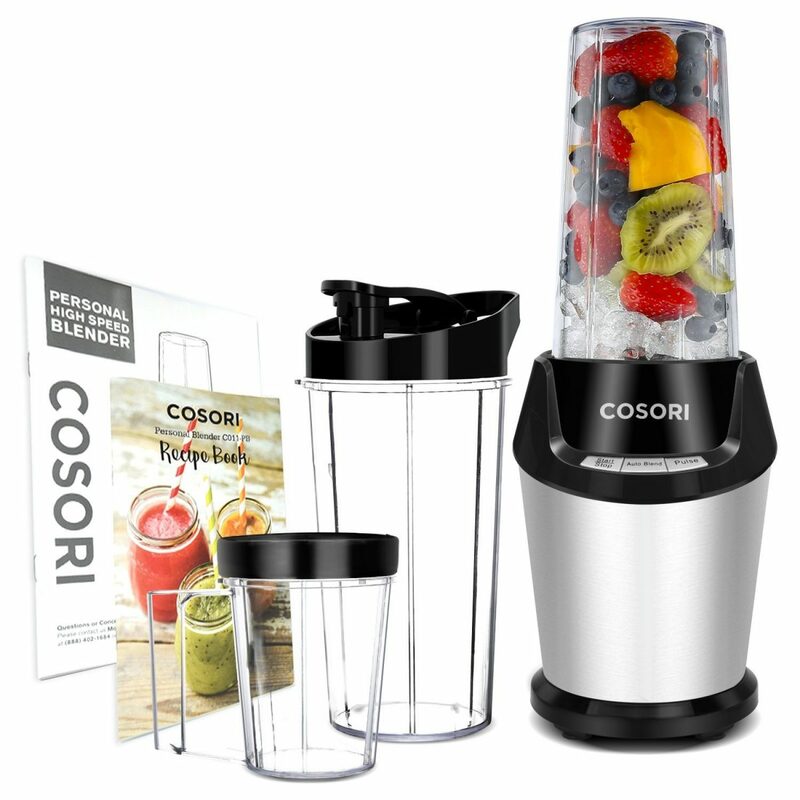 It can perform all the actions you'll need to pulverize and blend any smoothie ingredient. Yes, Karmin is also a good choice :).